All store filters (filterable attributes and categories) are listed in MANAdev -> Layered Navigation menu and every filter can be customized there individually. After clicking a filter in Layered Navigation filter list, new window opens with filter options. Name - filter block label, which appears in frontend. Filter name also is used to build URL. Name could be set on store level. If `Use Attribute Configuration' is checked, attribute label will be used. In Category - to show or hide filter block in Layered Navigation on category pages. This parameter also used for Layered Navigation on CMS pages or in Shop By Brand MANAdev extension. This parameter overrides Use In Layered Navigation value, which is set for attribute. Filterable (with results) - filter is shown in Category Layered Navigation. However only options, where product are available will be listed for the filter. In Search - to show or hide filter block in Layered Navigation on quick search pages. This parameter overrides Use in Search Results Layered Navigation value, which is set for attribute. No - filter will not be shown in Quick Search Layered Navigation. 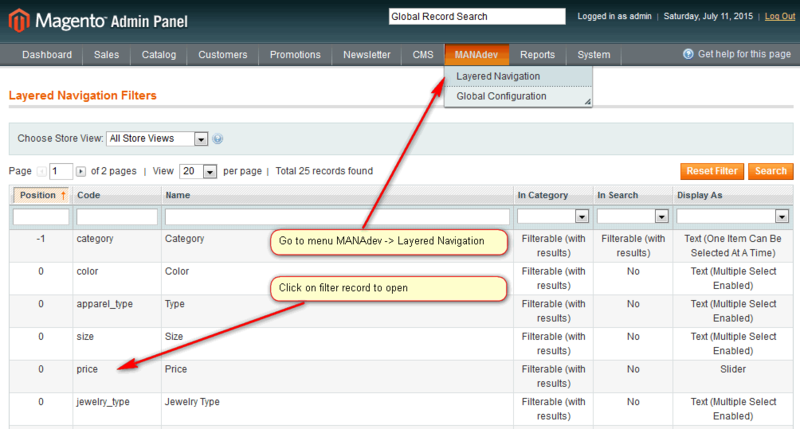 Filterable (with results) - filter is shown in Quick Search Layered Navigation. However only options, where product are available will be listed for the filter. Display parameter - here you can change filter appearance by choosing different template like checkboxes or slider. Drop Down - options are shown as drop down list. Position - filter position. Filters with lower position will be highest on the Layered Navigation. Sort Items By - how filter options are sorted inside filter. Position - all filter options are sorted by attribute option position. Options with lower position will be highest on the list. 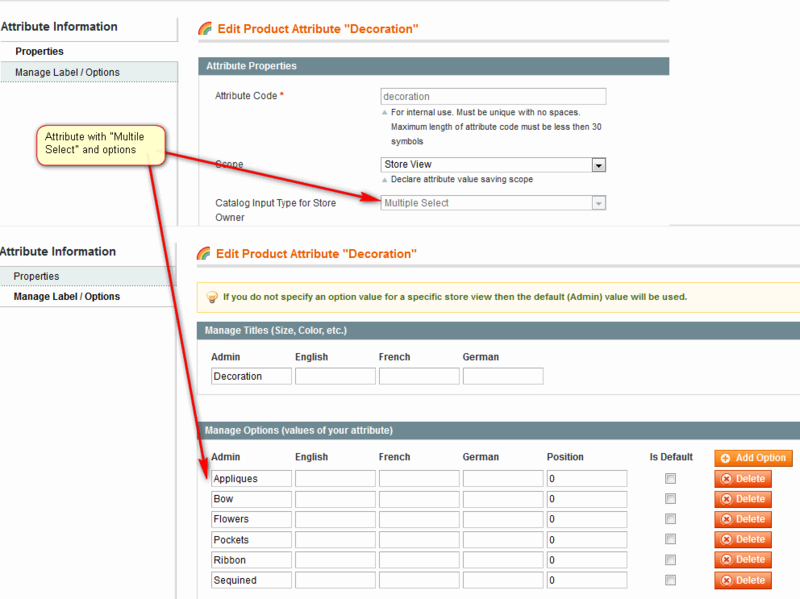 Option positions are set in Magento attribute management. Position (selected at the top) - all filter options are sorted by attribute option position, but selected options will be placed higher. 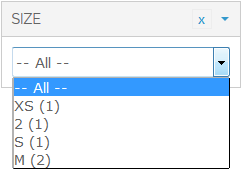 Name - all filter options are sorted by attribute option name in ascending order. Name (selected at the top) - all filter options are sorted by attribute option name in ascending order, but selected options will be placed higher. Count - options with the largest products count will be highest on the list. Count (selected at the top) - options with the largest products count will be highest on the list, but selected options will be placed higher. 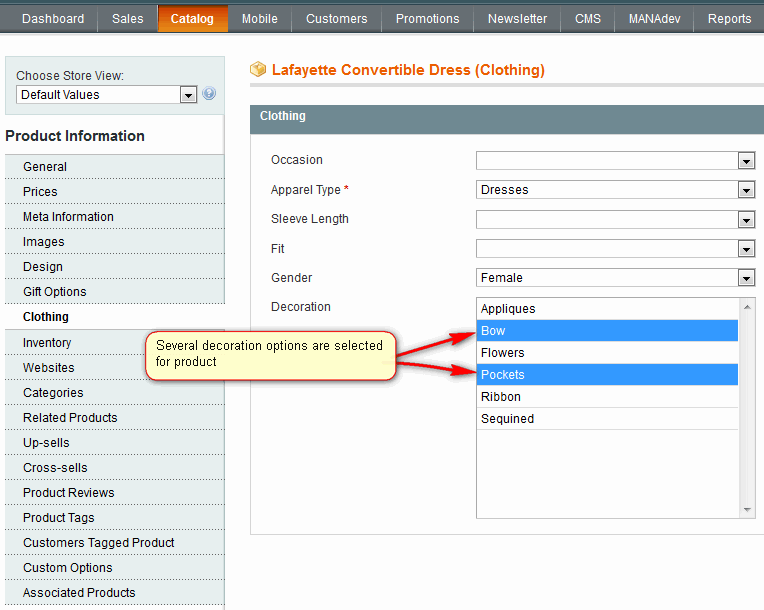 Combine Multiple Selections Using - defines how products will be chosen, If several options are selected within one filter. Logical OR - products, having ANY of selected options assigned will be shown. For example, if blue and red options for color filter are selected, blue products and red product and even those product which are red/blue will be shown. 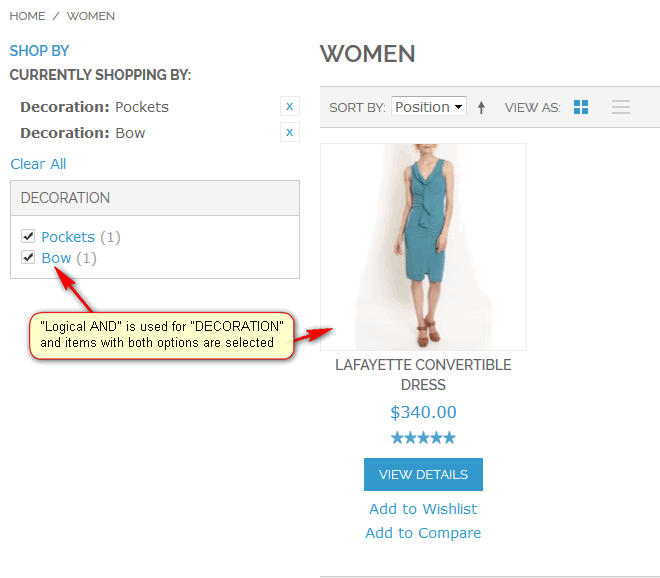 Logical AND - only products, having ALL selected options assigned will be shown. It is mostly applicable to Multiple Select type attributes. If Logical AND is set for Decoration filter, then only products having both Pockets and Bow options assigned will be shown when these two options are selected in Layered Navigation. Reverse Mode. If enabled, shows all options as selected and allows user to deselect items he/she is not interested in. 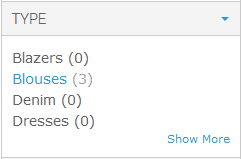 Filterable (no results) Links Are Not Clickable. If filter is set as Filterable (no results), it will list all options, even if no products are available. This parameter makes such options non clickable.